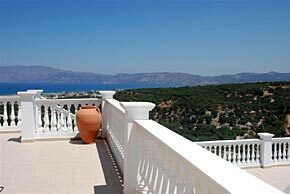 Set high on a hill overlooking the bay of Kissamos on the road to the ancient settlement village of Polyrinnia, Villa Christina is our largest and most luxurious holiday villa to date. This beautiful three-storey house, set in a half- acre of olive groves, has five bedrooms, five bathrooms, a luxuriously furnished sitting room and dining area, plus a kitchen with the latest in modern fittings and appliances. 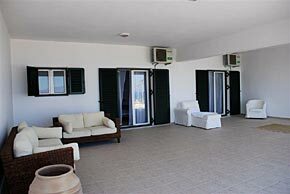 Outside there is a magnificent swimming pool and sun terrace, a further large shaded terrace and then gardens with flowers, olive trees and plenty of parking space. 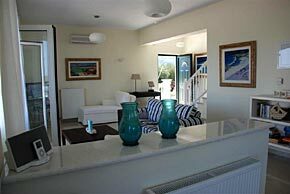 The top two storeys of the house are available as a three bedroom villa alone or the whole house can be rented as a five bedroom house when the two lower ground floor bedrooms are included. This can be a perfect arrangement when two families are travelling together. 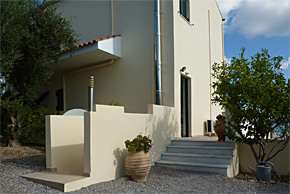 From the quiet Kissamos - Polyrinnia road, through a gated and walled garden and trees, Villa Christina reveals its two storey elevation and the front door at ground level. Alongside there are steps down to the lower ground floor bedrooms four and five. The main door leads into the sitting room where one is immediately astounded by the size of the rooms and the sumptuous quality of the furniture and fittings. Part of the sitting room embraces the dining area and off this is a superbly fitted kitchen which boasts every conceivable device through dishwasher to ice crusher. There is a cloakroom with its own shower. 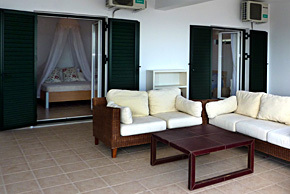 Villa Christina has central heating throughout the main building and has air-conditioning units in every room. There is satellite television. 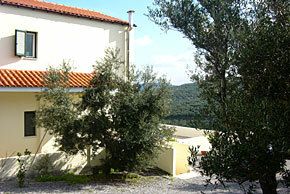 Stairs lead to the upper floor where again all the rooms are furnished to a very high standard. 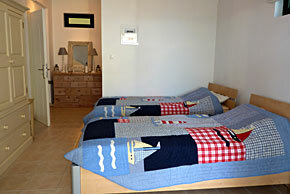 There are two double rooms and a twin bedroom. One double room has an ensuite shower room and off the landing is a family bathroom. 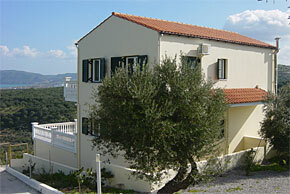 The two double rooms have french doors and balconies that have superb sea and mountain views. Outside and to the left of the main front door is a small flight of steps that lead down to the lower ground floor. Here we find a corridor from which there are two more beautifully furnished bedrooms. 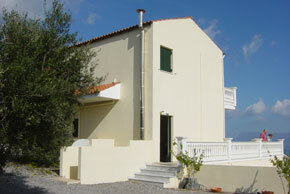 One bedroom is a double and one a twin, both with shower/bath rooms ensuite. Both these bedrooms lead out onto a large shaded terrace furnished with comfortable sofas and a chaise-longue - perfect for keeping cool in the breeze. Back in the corridor linking these rooms is a recess containing a washing machine, a refrigerator and tea/coffee making facilities so that the lower ground floor can be semi-independent from the main house upstairs. 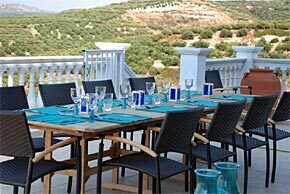 Outside there is a magnificent swimming pool, gated for safety, plus a huge sun terrace with furniture in a spectacular dining area for up to twelve people. Of course there is other lounging and sunbathing furniture around the pool. 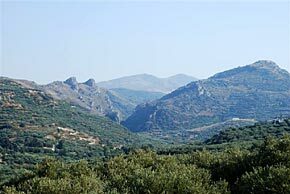 This luxurious holiday house is absolutely spectacular - magnificent views and scenery yet only two minutes from the bustling Cretan town of Kissamos-Kastelli and all its facilities. This house is available for long-term rental and special occasions only.